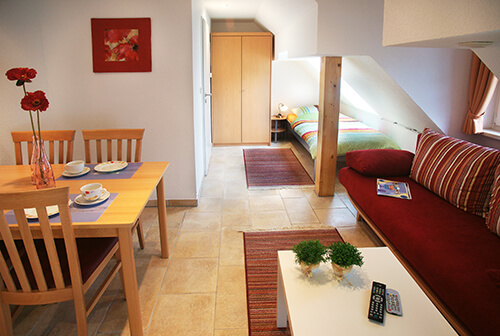 Your dream holiday home in Emlichheim. 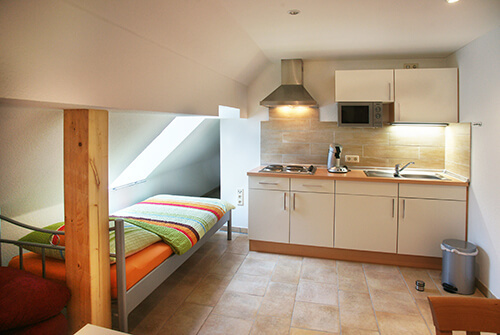 Modern appartements in historical house. to the website of Rötterink Guest House! 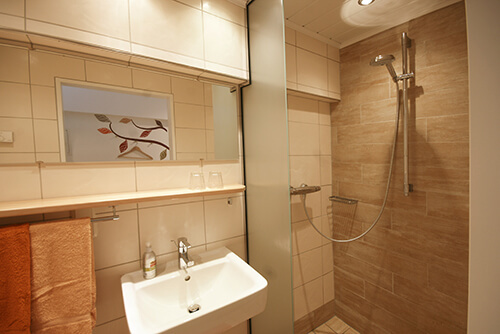 In 2008, we created spacious single and double apartments in our house, which were lovingly designed and expanded in the following years until 2015 with new apartments. 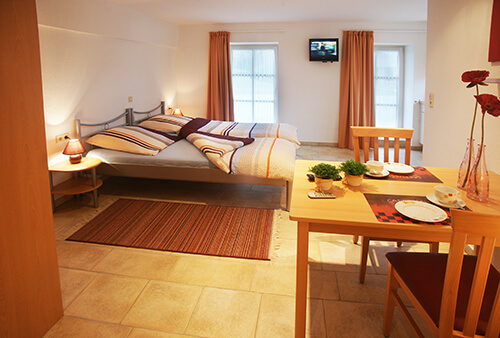 We are your personal "guesthouse with flair" in the countryside at the Dutch border (Europark). In the midst of a rural idyll near Emlichheim and the Dutch town of Coevorden, we offer opportunities for relaxed walks in the woods as well as extensive city strolls. 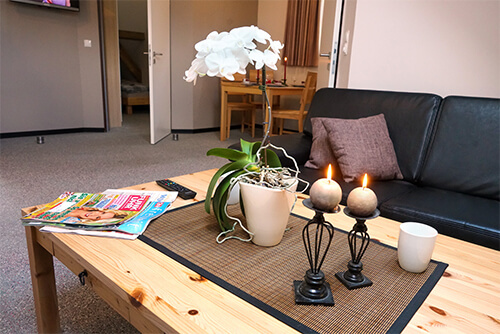 The nearby Slagharen amusement park, the Emmen Zoo or the Nordhorn Zoo are ideal for day trips and offer entertainment for young and old alike. 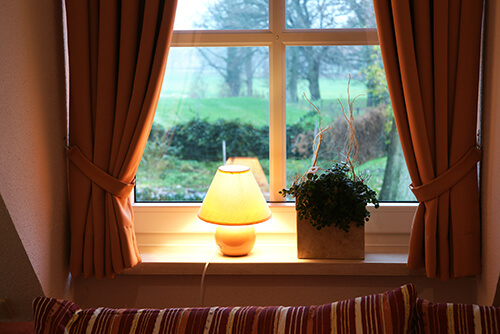 We are always anxious to offer our guests a pleasant stay and would be pleased to welcome you as a guest soon. The first building is heated by geothermal heat (heat pump) and there is also the possibility of cooling the guest house in summer. The newer of the two houses is supported by solar technology. 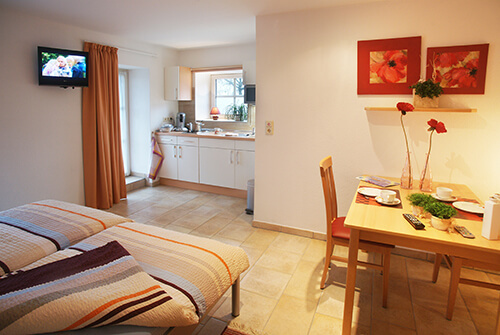 Our 13 apartments can accommodate up to 22 people. 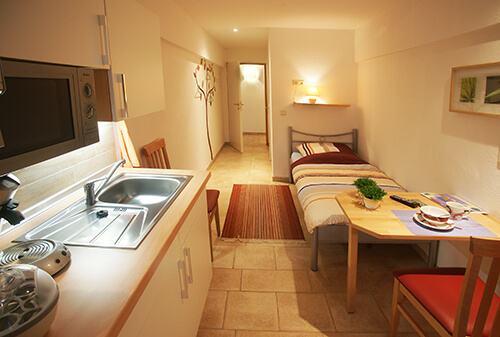 All units have a functional kitchen, modern bathrooms, TV and internet access. More apartments are currently in preparation. 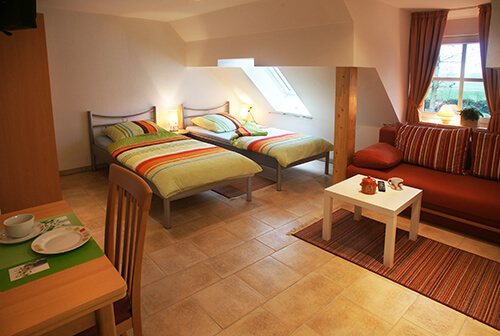 The guesthouse is located directly at the Vechte, and on various cycling routes. In 2008, the municipality of Emlichheim was named the most bicycle-friendly municipality in Germany. 3.5 km from the centre of Emlichheim, approx. 6 km to the Dutch border (Coevorden-Europark or Schoonebeek), 24 km to Hardenberg and to the town of Nordhorn 28 km. There are numerous supermarkets (Aldi, Lidl, Netto, K&K, rewe) and other errands are to be done there. There are also several snack shops (pizzerias, fast food restaurants and an Asian bistro) as well as restaurants and a bicycle repair shop. The traditional Naber bakery is located in the immediate vicinity. It is also possible to have breakfast in the nearby restaurant. Explore the Emlichheim area and make a detour across the border! Discover the nature around Emlichheim and experience extensive cycling tours along the Vechte and the Coevorden-Picardie-Canal. A trip across the border to Coevorden is always worthwhile. Besides interesting sights like the Kasteel Coevorden, the town also has excellent fried fish. 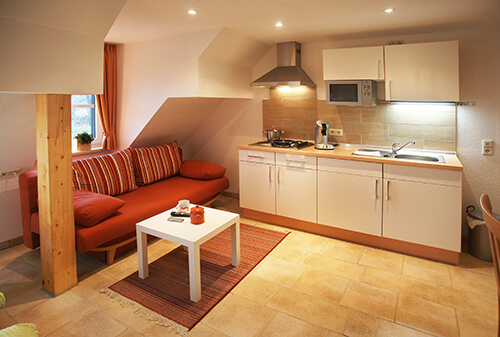 Whether in the Tierpark Nordhorn, the Emmen Zoo or the Slagharen Amusement Park - with the wide range of leisure activities in Emlichheim and the surrounding area, everyone gets their money's worth. Then write us a message or give us a call and we will organise your stay in our house right away! The house is surrounded by old trees and so I enjoyed - as a city dweller - the nocturnal silence and sleeping with an open window. I felt at home with you and would like to come back again. Thank you very much for your extremely hospitable stay in Emlichheim. We enjoyed the tranquillity and the beautiful surroundings. The apartments are worth five stars! 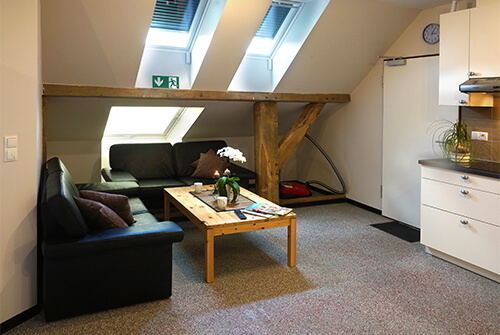 Extremely modern equipment and warm and cosy furnishings. 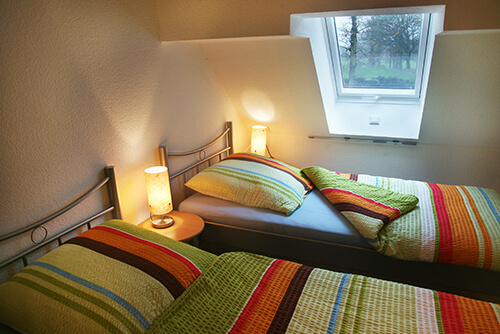 Family-owned since generations, our former farmhouse is the perfect starting point for a recreative stay close to the Dutch border. Look and see!